Now that the concepts of ECF Containers are explained we can take a look at the many container implementations that exist today in ECF. JGroups provider allows to adapt the JGroups protocol to an ECF container, consequently providing all of JGroups capabilities to ECF applications. 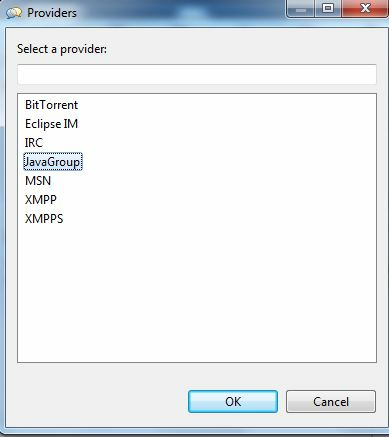 Protocol JGroups is documented at the JGroups site. The Example provider needs the following bundles. All stack names (refer to JGroups site for explanation of stacks) are available in the conf/ directory of distribution plugin. The stack description begins with a config tag. This config can be cut and added in a protocol stack (protocol_stacks) to configure the transport. 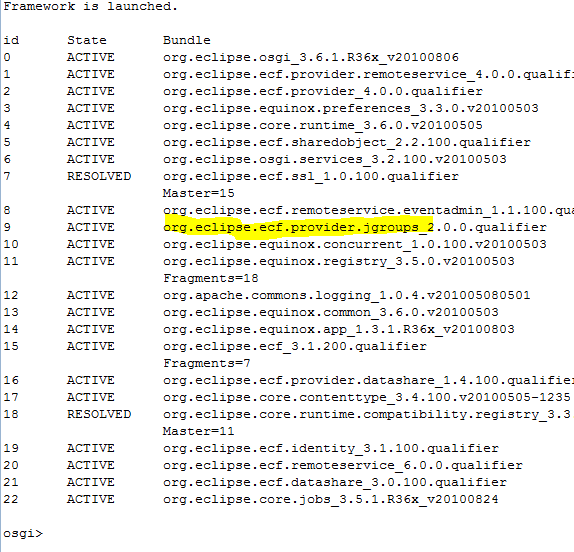 There is a default stack configured by default with ID : org.eclipse.ecf.provider.jgroups.default. 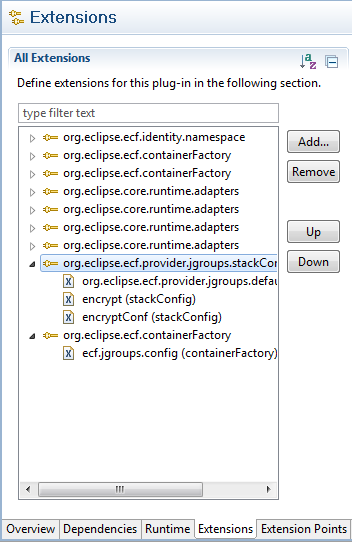 This stack can be configured with the extension point org.eclipse.ecf.provider.jgroups.stackConfig, providing an ID and a config file. A file named mystack.xml should have been configured and linked to the extension point in the JGroups plugin. Now that the container is initialized, we can use it. Second, we must connect our newly created container to the JGroups group. Then, we can repeat this operation as many times as needed. Now, we could work with the group, relying on JGroups reliable multicast protocols. ECF comes with an instance of the OSGi spec admin event service, DistributedEventAdmin which observes events of the framework. An implementation of an jgroups provider client can implement the org.osgi.service.event.EventAdmin service, providing all jgroups client the availability to send messages with a topic property. Now, as a client, I can post/send == aSync/sync topics on the group. The client container has been started and now can be used in this group manager. Here it sends its interest on the topic jgroups with property doc. We see the active bundle org.eclipse.ecf.remoteservice.eventadmin that provides the Event Admin OSGi specification which follows the Publish-Subscribe pattern. See here for more on ECF implementation of distributed EventAdmin. We have started our jgroups bundle but we have not used it yet. 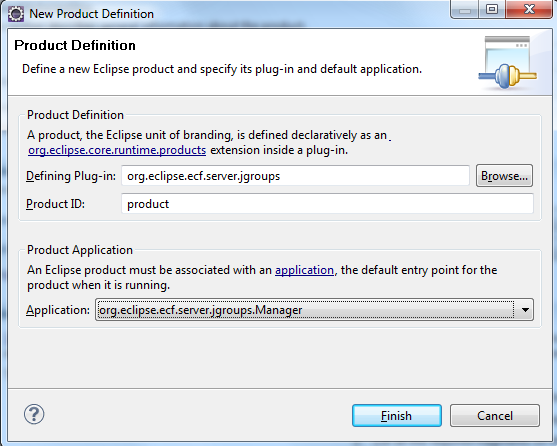 We select the appropriate application ID in the drop down box, here org.eclipse.ecf.server.jgroups.Manager. Befor launching this configuration, prepare a JGroups manager with this ID : jgroups:///sampleChannel?stackName=encrypt. To achieve that, add the parameter -containerID=jgroups:///sampleChannel?stackName=encrypt in the lauch configuration of the manager/server product as seen above. This page was last modified 13:59, 6 March 2011 by Wim Jongman.